Compare prices on car hire in La Rochelle from all the major brands and find the best deals. When you book through us, unlimited mileage and insurance are always included in the price given. La Rochelle is a city in western France in Poitou-Charente region.The city is the capital of the Ministry of Charente-Maritime. 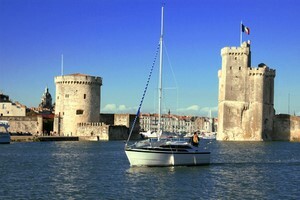 La Rochelle is located on a cove in the Ile de Ré in the Bay of Biscay, north of Bordeaux and south of Nantes .Approx. 77,000 residents live in the city, 117,000 with the suburbs. La Rochelle is one of France’s most important fishing ports. La Rochelle was founded in the 1100s, and was a controversial point of support for the Huguenots during the religious wars. The city is known from Alexandre Dumas’ The Three Musketeers in 1844, where part of the action is added to La Rochelle. The city became a German submarine base during World War II, but the city’s old town is well preserved. Here is the example a Renaissance town hall from the 1500s, the three towers tour de la chaine, tour St. Nicholas and the Tour de lantern, dating back to medieval times. There is also a beautiful cathedral and a large aquarium. The city also hosts several festivals, including a film festival and jazz festival in the summer. The airport is La Rochelle is about. eight kilometers outside of town.